Exhibitor and freight entry to Boise Centre West is via the 9th Street loading dock at 250 S. 9th Street. The loading area consists of three loading bays with dock levelers, and a drive-in access ramp. The Grand Ballroom (100) has a 12′ wide, 16′ overhead door with drive-in access. The loading and unloading lane on 9th Street is available for use, but extreme caution must be taken because of oncoming traffic. Due to commitments to other events and building requirements, not all bays and load in areas may be available at all times. Please coordinate your event dock needs with your Event Manager. 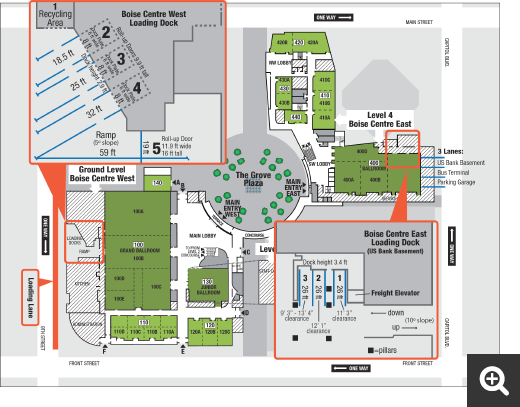 Exhibitor and freight entry to Boise Centre East is via a loading dock underneath the US Bank Building at 101 S. Capitol Blvd. The loading area consists of two loading bays and the East freight elevator that services the 4th floor meeting room and ballroom spaces. A second freight elevator is located on the 3rd floor of the City Center Plaza parking garage for vehicle unloading. The West freight elevator is located on the 3rd floor of the City Center Plaza parking garage. The West freight elevator has the same height, width and depth measurements as the East elevator. A designated parking space near the elevator may be reserved for load in and load out. Please speak with your Event Manager to confirm the use of the loading bays, freight elevators, and designated parking spaces.